The Light vs. 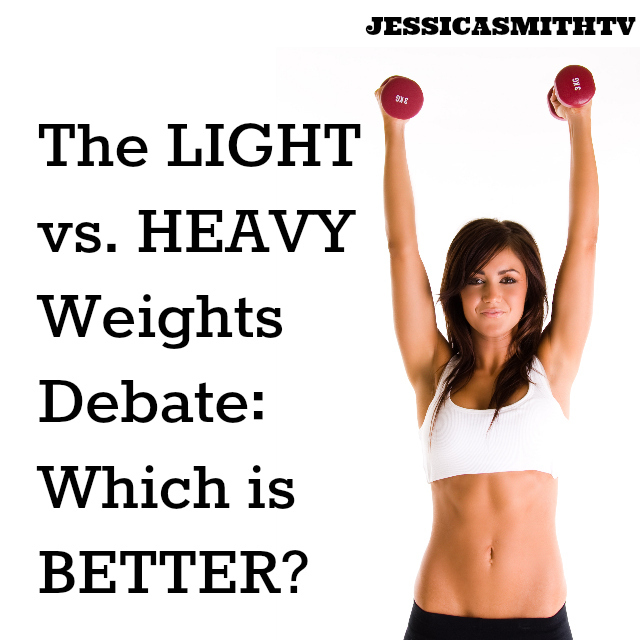 Heavy Weights Debate: Which Is Better? As a certified trainer, I am often asked: Should I lift heavy or light weights? How do I get that perfect body? Won’t lifting heavy make me bulk up? Isn’t lifting light weight just a waste of time? And while I know many trainers would disagree, my answer is that both types of training can offer significant benefits. You’ve probably heard many experts down play the effect of lightweight training, saying they just aren’t enough to offer any kind of real challenge or stimulus for your muscle (and if you are only doing a few reps here and there with them, never reaching muscular fatigue, I would agree). And on the other end of the spectrum, I’ve heard a few experts suggest that lifting anything over 3 three pounds is a recipe for enormous bulk in women (to be clear, I’m not saying this at all – women DO need to be able to lift heavier loads, and do it quite often just during daily activities alone). Personally, I’m a fan of both types of training, but believe that the choice of which you decide to use depends on your body and your personal fitness goals. I hear that snacks for body builders work really nicely with most workout routines. My friend uses them and has seen the difference even while going for less reps. While it’s true that you’ll need to use less reps to get the job done with heavier weight loads, you’ll also need to be using excellent form and control as the potential strain or stress it will put on your joints increases with the weight you lift. If, for example, your goal is to put on a significant amount of muscle mass in a short amount of time, lifting light probably isn’t going to be the best method for you. On the other hand, if you suffer from joint issues or simply don’t have access to heavier loads (if you train at home, for example) lightweight training may be a more appropriate fit for you. Tell me, what kind of weight do you like to use during your strength training workouts? What are your thoughts on this debate? Sources: Canadian Science Publishing (NRC Research Press). “Building muscle without heavy weights.” ScienceDaily, 26 Apr. 2012. Web. 13 Jan. 2013. McMaster University. “Light weights are just as good for building muscle, getting stronger, researchers find.” ScienceDaily, 30 Apr. 2012. Web. 13 Jan. 2013. When I strength train I use 10-15-20 lb weights. For barre, yoga, or quick aerobic workouts I use 2-3-5 lb weights. Mostly I listen to my body. If something feels like it is gonna snap off, instead of pushing and hurting myself I’ll drop down weight wise or alternate arms or pause for a rep or two. Just depends on whats being performed. Cardio is my weakness so give me heavy strength training any day! I think that stems from growing up on a farm. I feel like I am accomplishing something. From a physiological standpoint, it depends what you are working towards, looks, strength, or looks and strength. Doing reps of short sets with heavy weights damages the muscle tissue.. this leads to ‘bulking’ as more muscle fibres are produced in the repair process.. but this only adds a small gain for strength (think of a weight being suspended on cotton.. bulking is basically like adding an extra thread of cotton every now and then). The perfect example of this is the massive guys that do the weights in the Olympics.. yes, they can lift massive weights.. but they can usually only do it for a short time. Whether you have big or small muscles, using light weights for long sets to the point of fatigue actually ‘conditions’ (removes the rubbish and makes the fibres more effective) what muscles you have. This is basically contrasting aerobic and anaerobic exercise.. ideally you need to do both. Up until recently, I have always been quite a scrawny looking guy.. but I worked in the cellar of a bar for ten years.. every Christmas we had to order so much beer that it didn’t fit into the building so we had to stack the kegs on top of each other! these hold 22 gallons of beer and weigh about 14 Stone when full. Now I do both, I use 2.5kg for long (50+) sets every day, and once or twice a week use 10kg for short sets to ‘bulk up’ a little. I usually use 3 kg weights, because I usually have only those. For the ballet and pilates routines they are really too heavy and sometimes I have to put them down. On the whole, using weights that are a bit heavy for high repetitions has improved my overall strength. I can manage 5 and 6 kg weights when they are required and I can now do pushups on my toes. You always have to push yourself as far as you safely can and you’ll be seeing results. Of course, I have not been gaining bulk, but I’m defined and stronger. I’ve lifted both heavy and light over the years, mostly switching it up every other week. However, for the past 7 weeks I’ve been lifting heavy 3X/week – just my own routine at home – and I’ve noticed a big difference! I had been really slacking off the weights for quite some time and exercising very inconsistently. My strength has come back very quickly and I’ve been able to double what I’m lifting for most exercises. I’m totally wiped out when I’m done, but it feels soooooo good !!! What an interesting article! It’s true, I often wonder whether the weights I use to train are adapted. I have 3 sorts of it : 1, 2 and 3 kilos. I use those of 2 kilos for triceps and shoulders and those of 3 kilos for biceps. I only take those of 1 kilo when I feel a little tired. I believe that this is not so bad because I find that my muscles are drawn rather nicely without being striking. It is the result I was looking for. I’ve started the NROLFW over again and find myself on a guilt trip when I’m not lifting as heavy as I was, but I surely do appreciate not feeling like I was hit by a truck the next day. Slow and steady wins the race, at least that’s what I’ve always heard, right? I just finished the Stride and Strength workout, and I’m sweating, thank you Jessica! I am currently using much lighter weights than ever, sticking to barre/ballet, pilates, and yoga for weight training. I have to out of necessity as I’m nursing an elbow tendonitis injury. Know what? I am still strong in my daily life. And, I’m more flexible. If I ever wanted to lift heavy again, I think it would have to be after having some PT sessions as I’ve not been successful with that (always re-injuries my old elbow injury). I think either one is great and, as you said, your body’s needs/limitations and personal goals much always be a deciding factor. Thanks for the GREAT article. I love incorporating weights into my workouts. I haven’t been using them for very long and I am cautiously and slowly increasing the weight. I am currently using 3-5 pounds. If the goal is getting to muscle fatigue then I would think that either lighter or heavier weight should work as long as you do the appropriate work. My concern is proper body mechanics when using weights. I’m not sure that I always understand if I am correct and don’t want to risk injury. I think this is a great article advocating to simply do what’s best for your own body. I like to do a mix of heavy, light and body weight exercises. I think you can tone your arms very effectively using your own body weight….I mean, have you ever looked at your Yoga instructors’ arms?? Wowee…Yoga arms are very impressive. Jessica, what is your thought about solely using yoga as your method of strength training? I’ve asked this question to many people and most traditional “gym” folks say you have to use weights to be effective. Just curious what your thoughts are. Hi Lisa! You can definitely get a great workout using just your bodyweight, and enough that you can develop muscle doing it too. In my opinion, I think it truly depends on the type of yoga you are practicing. In some cases, you may not target the body evenly (for instance you may work more of the front of the body and not as much of the back, which can create imbalances). That would be my only reason for not sticking with “just” yoga for strength training.. though I’m not a fan of only doing 1 type of training in general.. I think a balanced routine is your best bet for a healthy, strong and balanced body. Hope that helps! I workout at home and my heaviest hands weights are 20 pounds. I’ve been meaning to get heavier weights since I’m finding with some moves, the 20 pound weights are feeling too light (chest press & dead lift). I do a combination of light and heavy training. It depends on how I feel (I have fibromyalgia and if it’s a day I’m feeling sore, I tend to go lighter weights. I do find this helps with pain, too). I tend to try a lift heavier when it comes to my upper body and do less reps. With my lower body, I tend to use lighter weights. For example, if I’m doing lunges with weights, I would use a 5 pound weight in each hand. I find if I use heavier weights when working lower body, it creates more strain on my joints. If I’m learning a new exercise, I usually will use lighter weights till I’m sure I’ve got the form down and at that time, switch over to a heavier weight. I really enjoyed reading your article, Jessica and I find it so timely since I was wondering earlier this week what would be more beneficial for me. It was certainly very helpful! I used to lift mostly heavier till I really damaged my joints, especially my elbows going too heavy with palms up biceps curls, using a combination weight and band then followed by some serious snow shoveling. Now it is light weights only, even no weights isometrically, or a slightly heavier weight supported by both hands like a single dumb bell, medball, or kettlebell.. My elbows have been fine as long as I heed their slightest twinge. Just takes one dumb day to chronically damage a joint. Same can be said going too fast with light weights too. Recently, this has become quite the issue in one of my gym classes. Typically, the instructor tells us to start off with a heavy weight (unless we are instructed by her to go with lighter weights) switching to lighter weights if form our form is being compromised. Lately, she has really been drilling in the point for us to use weights higher than 5 when doing back exercises, stating that our back muscles need more weight to fatigue. I tend to agree with her in that regard, but am still on the fence with respect to going to automatically starting off with a higher weight in her class because our reps are usually 15 or 25, oftentimes repeating the set. This is SO timely. I am doing a heavy rotation right now (New Rules of Lifting for Women) and have been pondering whether to continue or change it up to something more endurance-oriented. I always feel like I OUGHT to do heavier stuff; but when I do, I 1) gain weight, 2) dread my workouts, and 3) get very achy. Why in the world I feel guilty for somehow “not doing it right” is beyond me. So silly. I guess “doing it right” comes in different flavors!! I think your post just pushed me over the edge I’ve been teetering indecisively on. I’m going to switch it up. Hi Susan! So happy you found this helpful! Its funny how we can feel we should be doing things a ‘certain way’ but our body really always does know best! So glad to hear you are giving yourself permission to switch it up and do what feels right for you 🙂 Keep up the great work!! Susan, I’m the same way! I love how powerful heavy lifting makes me feel, but I don’t like the increased hunger or the achiness that comes along with it.